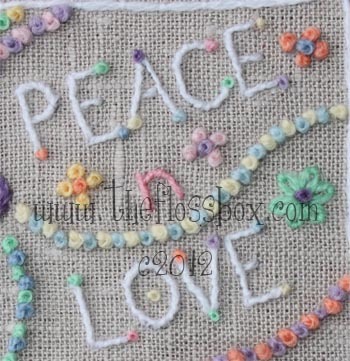 This was the theme I chose for my January 2012 embroidery journal project. Little did I know that that theme would stretch through the whole year. Actually, I purposefully didn't choose a theme. I didn't want to limit myself. I wanted the freedom to make a project for each month as it came. Each of these projects have a meaning, something I was trying to convey, to remember. All of these I have done for myself. Most didn't even get any particular notice by the public, but that was never the goal. But each one is a new beginning of sorts. For me. I will go ahead and list them. January - this project was created with the idea of new beginnings. I took a pencil and drew. What I came up with was a seed. The perfect new beginning. 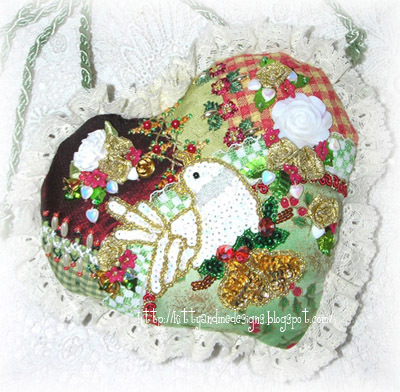 Februrary - I did this little bird with crewel yarns. This has been a new thing this year. I have found threads that I love. When I pick them up and sort them out, they always make me feel like making something. Every time. March - I rediscovered music. I got a clarinet and began playing it after years. It doesn't matter how good I ever become, what's important is the challenge it gives me. Another way to express myself, another front to grow on. April - Spring is my favorite time of year. It came a little late this year, so it officially began in April. The whole world explodes in joy. May - I captured the tadpoles in stitches. As the squiggle about searching for food, growing, developing. New life is always amazing in any form. June - This was my effort to capture my beginning point in free form embroidery. Abstractness never gets the interested that recognizable forms get. But I would argue, that learning to abstract is a necessary skill for any artist (or there could be a good many other uses for such a skill), since we only ever make representations of things, and never the actual thing. July - Moving in to color. This was me marking a point in beginning to really see color. It changes your world when you do this. I encourage everyone to try their hand at color journals, even if you are like me and don't make it far. August - I was restless to try something different. A new way of thinking. I chose the idea of a gate into a magical forest world. It marks a beginning into a more fantasy-oriented place for me. September - Sitting by the window reflecting on the light filtering through the maples. Fall can be glorious. October - I was moved to try something new for me. I made this small project wtih the purpose of learning how to take advantage of the yarn's properties to create interest and texture. I hope this is just the beginning of this type of work. November - My somewhat feeble attempt to capture the forest around me. 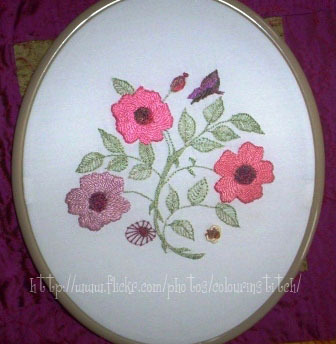 Again, a beginning for creating richer, textured embroideries. December - My crazy santa, based on real life! This is a beginning too. As I end the year, my thoughts turn to using art to tell a story. My own stories, real or imagined. I am not sure I could do a good job telling someone else's! This year has been busy, it has practically flown away. I'm afraid this is how it is as you grow older. It becomes even more important to grab hold of the things that are important to you. Moments deserve to be remembered. They are the foundation of who we become. Now as I said before I have come full-circle. This is a new beginning for me now. I have changed so much myself in the past year or two. I was restless, anxious, not sure what the heck I wanted to do about my work, embroidery, art, blogging, you name it. The way is hardly clearer now. It never is or will be, but perhaps I am more at ease with that. Uncertainty is a difficult thing for us humans. But through art, you can learn to embrace it. Appreciate that it can mean a great many good things if you let it. Explorations and discoveries await around every corner. I can't go back to the way I used to blog anymore. It isn't interesting, it stops me in my tracks, every time. My projects are lovely and all, but they are not the important part. It's what I learn from them. About myself, about the world, and how well I can inspire and challenge others with them. This is the time to look ahead to 2013. To be thankful for the days we have together. To fill them with meaning and purpose and joy. To be better than we are now. I had this design idea sitting around for weeks before I finally came around and decided it was time to make it. I'm glad I did! Really glad even. I can honestly say this one was fun, very fun even. Soft wools, bright colors, fun shapes. I think I shouldn't have waited so long! Now I have another idea brewing that's in a similar style. Maybe even more shades! 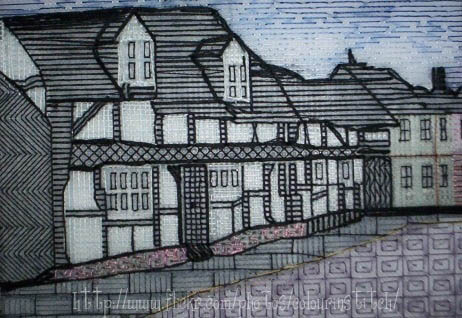 This will be another square in my crewel squares project. It's that time again! The final project for the embroidery journal project for the year. I feel this project brings me full circle, but I'm going to save the year review for another post. For now I will focus on this project! This is after a little drawing I did for our scrap book journal. We are busy catching up from last year, so I had out some photos from Christmas 2011. I thought the drawing I had made was fun, so why not turn it into an embroidery. An embroidery that not only means something for me but tells part of a story. Here is the photo of santa that I based my artwork on. As you can see, there is no "perfection" in my version (I am certain I broke all the "rules" for proper crewel embroidery), instead it's about telling a story, a memory of a santa that doesn't just give gifts without challenging you first! This tip is primarily for those using Google's blogger, but can be a handy thing to consider for others. I've been coming across some bloggers lately that have suddenly found that they can't load up more photos! This is because they have come up against the limit of free space on Picasa. The limit stands at 1GB. Which you can think ought to be enough, but if you load up lots of photos without any resize, you will hit the limit fairly quickly. And in this day when people go around with phones and want to be able to upload as they go without any image manipulation, the space will quickly be used. That's by design though. They want you to buy from them. It costs about $30/yr for 25G. It's a fair price compared to the other offerings out there, but it does cost. Another small tip is if you use the same photos across several blogs, then you can go in and pull up the same photo from your albums without uploading it again. There are alternatives to using up your blog space though. 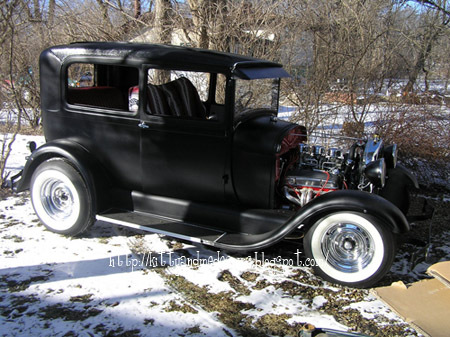 You can use Flickr to load up pics and then use their interface for adding them to your blog. Think though that if you don't pay for Flickr either, you will only see 200 pics at a time, and you may have difficulty deleting some of them. Plus your monthly upload is capped at 100 MB, so again, if you upload large photos, you will hit the cap fast. Wordpress offers 3GB of free storage if you run your blog on wordpress.com. Remember though that this will include everything you load up, not just photos. The text doesn't take too much space, but it will add up. The database storage might be included in the 3GB (read the fine print on this), and that definitely uses up some space. If you are on blogger and want to figure out how to check how much space you have, go to your account overview, then click on Products, then on Picasa Web Albums. There at the bottom in tiny type, you can see how much of your allowance you are using. If you are willing to pay for your blogging, which most serious bloggers end up doing in one form or another, then you have a wide variety of options to choose from. Take some time to make sure to find the one that suits you best! An embroidery I did last week. 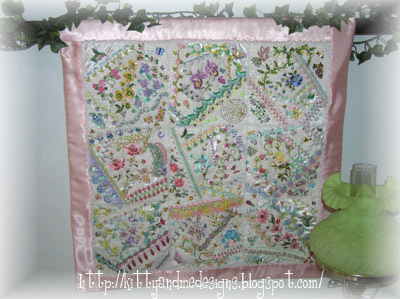 I finished it into a little quilted wall hanging with a vintage lace border. I'm trying to actually make some of my embroideries into something as I finish them instead of just throwing them on the pile for later. The pile is impossibly big now!!!! 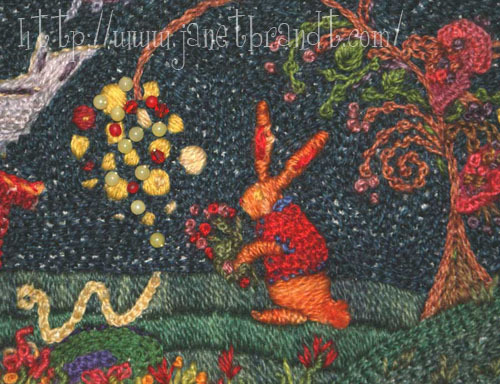 A new stop on The Floss Box Fall 2012 embroidery blog tour. 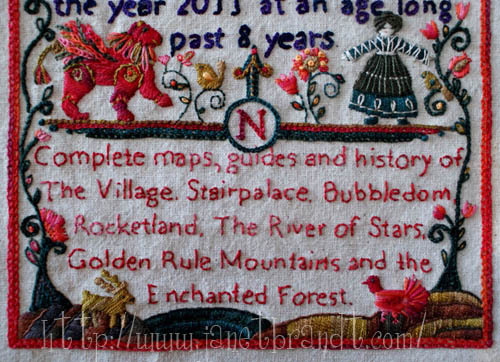 This time we are visiting Janet Brandt's blog Embroidery and the World of Possibilities. 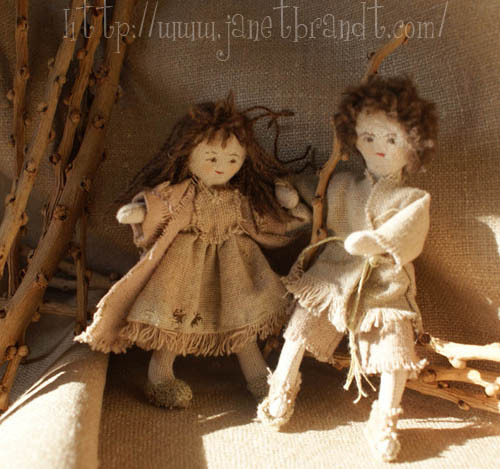 If you haven't visited Janet before, be sure you do, her works are delightful! I have been stitching for as long I can remember. One of my very first shopping memories is loving a display of embroidery floss at a dime store. The threads were yellow/gold and that color sends a thrill through me to this day. My parents owned a women's clothing store and salesmen would send us boxes filled with scraps of fabric from the cutting room floor. Great fun for doll clothes! It was also a great environment for all things fiber. My sisters and I did display work from a very early age and I started drawing the newspaper ads when I was 13. My great grandmother lived with us and she was always stitching. And my grandmother was an accomplished needle worker. I don't remember any lessons at their knees or anything quite that formal but I loved seeing what they were doing. I'm sure they must have taught me some of the basics. I played with all sorts of creative materials on my own. I was always holed up in my bedroom making something. And I read books and magazines, anything I could get my hands on. I now have a very serious library of titles related to all things textile. 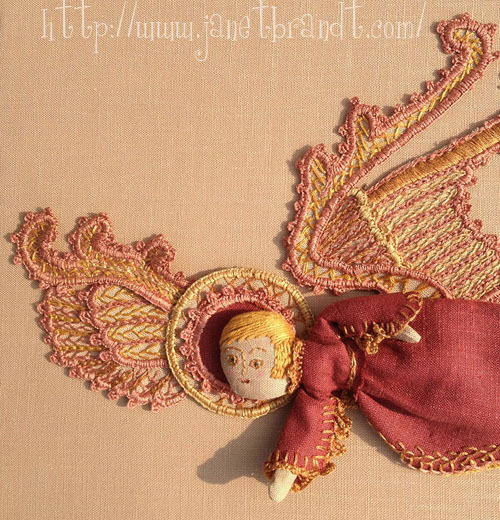 Over the years I've embroidered, made dolls, hooked rugs, made quilts,and have now returned to embroidery. How much time do you spend working on embroidery in a day on average? Never enough! If I get in a couple hours of stitching a day I am very happy. Some days the hands are just too tired. Other day there is design work to do either on the computer or drawn by hand. I love a variety of techniques. 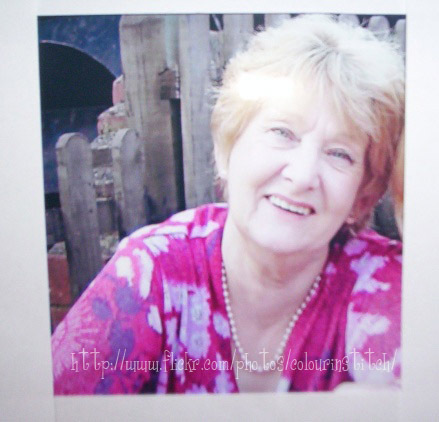 I now bring my experiences of crochet, dollmaking, quilting, drawing and applique home to my embroidery work. I use, I borrow, from everywhere to get the effect I want. I started playing with stumpwork just a couple years ago. And my own version of crewel embroidery. 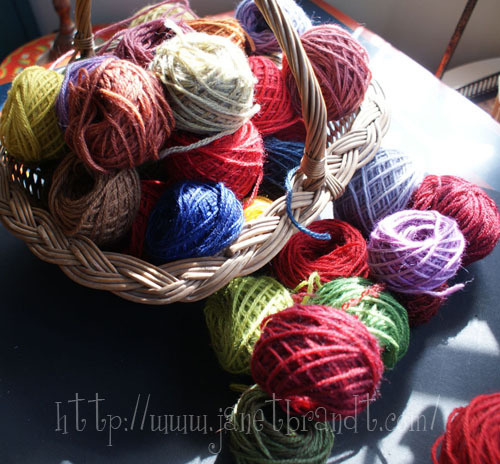 Because I dyed my own wool fabric colors for rug hooking, I am able to dye my wool yarns for stitching. Everything! Well almost, my hands and nails are just too rough for silk! 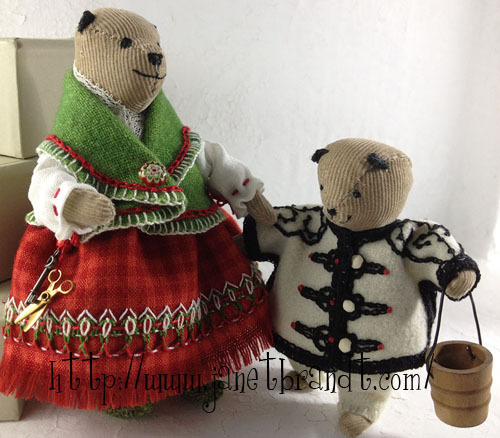 I have always been in love with the ethnic embroideries of the world, eastern Europe in particular. All that red is so delicious! I love their timelessness and the universal themes they depict. Hearts, hands, birds and trees are found in most cultures. 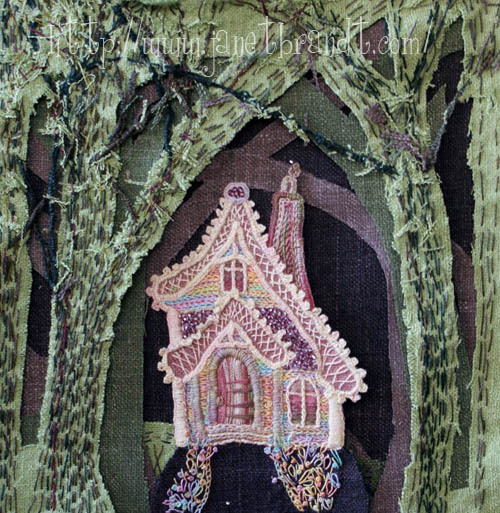 Many stitchers are intimidated by stumpwork and crewel work, do you have any tips on how to get started? 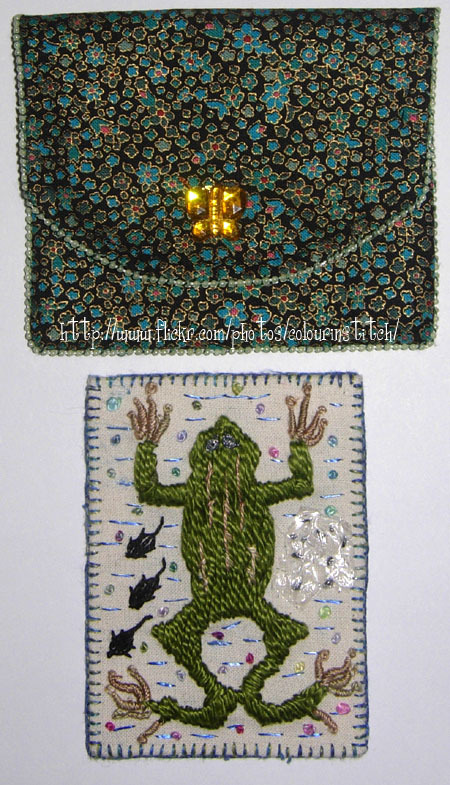 Over the years I taught classes in rug hooking, applique and embroidery. The most important lesson I think I can share with any student is to have fun. And to listen to what makes you happy personally. After all that's why we do this. More practical advice is to start small and if possible with a kit/class. Be patient with yourself, and realistic with your expectations. Practice makes perfect is a well repeated phrase for good reason! Over the years most of my work has been done for publications in books and magazines as how-to articles. 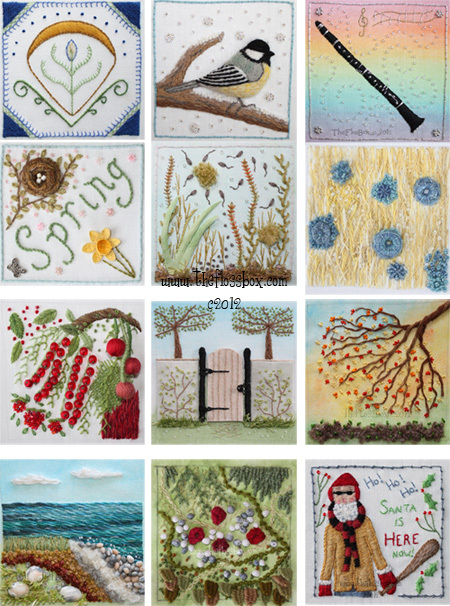 I've written 4 quilting books and one book about the creative spirit in all of us. 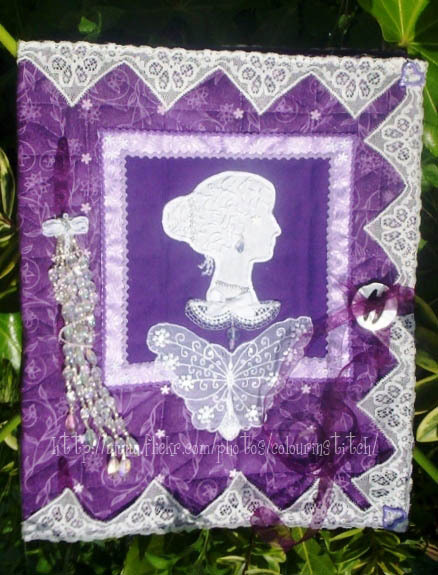 I use my embroidered and applique wool quilts to illustrated that book. I'd love to carry on in that vein and publish my embroidery work one day soon. I am using my embroidery to tell the traditional stories and the stories of a "World of Possibilities" that I am creating. What else do you enjoy doing? I just became a docent at the Indianapolis Museum of Art. The training was 13 months of amazing classes of art history as well as practice giving tours and, most important, engaging the audience. I want people to enjoy going to a museum and not fell intimidated. It's just art and we're all creative people! Last week I joined in TAST to try doing something with needle-woven picots. These are fun stitches, but I really haven't used them in projects too many times. This whole little project is a little accident! Even the fabric was a painting experiment I never intended to use for a project. I was going to cover it with the picot stitches, so you couldn't see it. But after making a few rows, I thought it could work as a crown for a tree, so I put down a little scrap of fabric as a ground, and there I had a little tree! Fun stitch, be sure to give a try. There surely are many more interesting applications! Welcome to another stop on The Floss Box Fall 2012 Tour of embroidery blogs! This time we are making a stop to visit Amy of SewAmy. 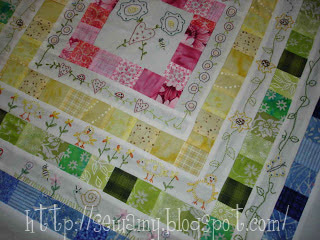 Amy does a variety of stitching and quilting and combines them into her beautiful creations! 1. 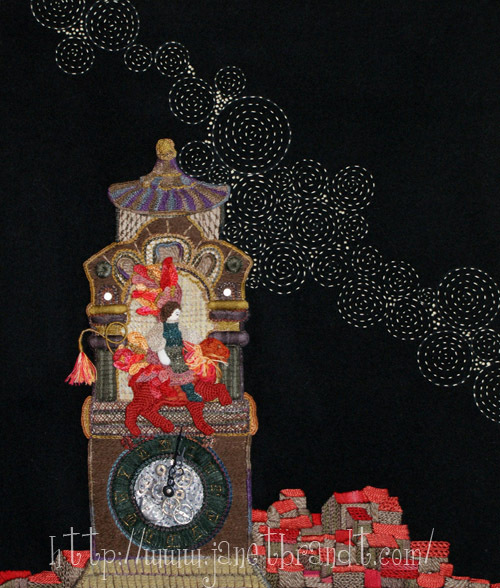 How long have you been embroidering? I have only been doing embroidery for a few years, 5 or 6 maybe. I started cross stitching when I was a teenager and did it all the way into my late 20's. 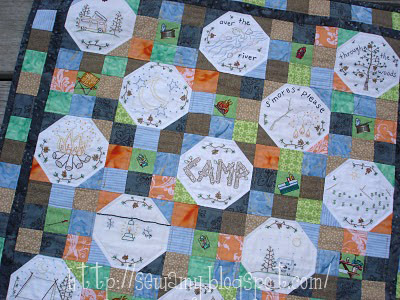 In my thirties I learned how to quilt. It wasn't until my late 30's that I learn to embroider. And now I am coming full circle and cross stitching again. 2. How did you learn? I learned by teaching myself. I checked out embroidery books from the library and looked up how to do stitches on line. 3. Why did you start? Because I was into quilting, I went to our local quilt show every year. One year I noticed a booth with quilts that had embroidery work on them. They were gorgeous. The company was 'Bareroots'. I bought my first pattern and fell in love. The pattern is called ' What color is Spring?'. 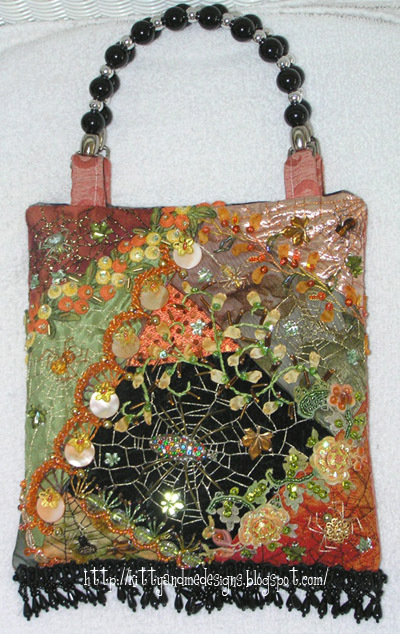 ( I included a picture of it) I've since stitched and made many of Bareroot's patterns. 4. What are your favorite types of embroidery? 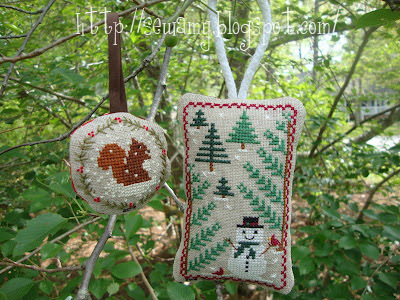 To stitch embroidery, my favorite is just the plain ole 'back stitch'. 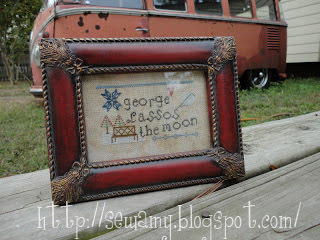 But to look at embroidery... any type.I am loving cross stitch right now too. Crewel work amazes me and I'd love to learn how to do it one day. 5. What are you favorite projects? My favorite projects are when I get to stitch by hand and I add a bit of 'me' into the project. I made a camping wall hanging (pattern by Bareroots) and I changed some of the embroidery from the pattern to fit the way we camp, which is in a VW bus. 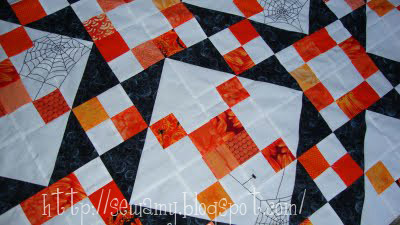 When I made my Jacob's Ladder Halloween quilt, I added embroidered spiders webs and spiders to it. 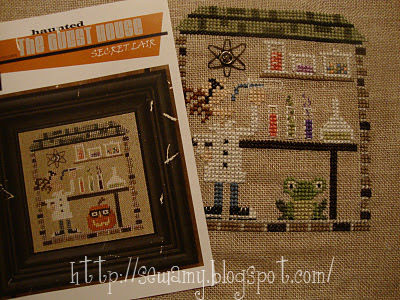 When I cross-stitched up a little 'Science Lab' (pattern by Bent Creek) there was a pumpkin under the lab table. I had to change it to a frog because I have a big thing for frogs/toads. I just love when my projects have that personal touch to them. 6. 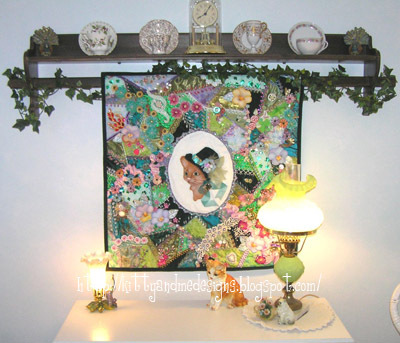 What do you do with your finished stitcheries? I've only framed a few. 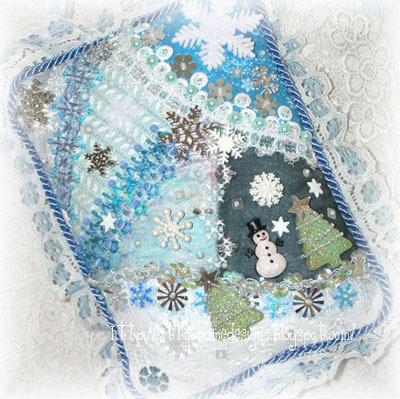 I really like making my stitcheries into usable things... like quilts, pillows and pillowcases, needle cases and Christmas ornaments. 7. What other hobbies and interests do you have? I love to camp. My family camps in our 1970 Volkswagen camper Bus 8 months out of the year. Being a mom, I am always looking for things our family can do together before the kids grow up. I do paint a tiny bit, but stitching is my favorite so anytime I have any extra time I am stitching. My favorite way to stitch is curled up , watching a movie (mostly chick-flicks) and sipping wine. 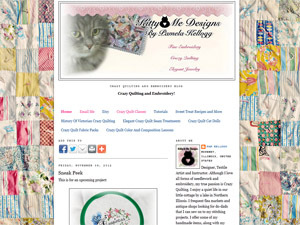 Be sure to visit Amy and see all of her wonderful creations!! Stay tuned for more stops coming soon! 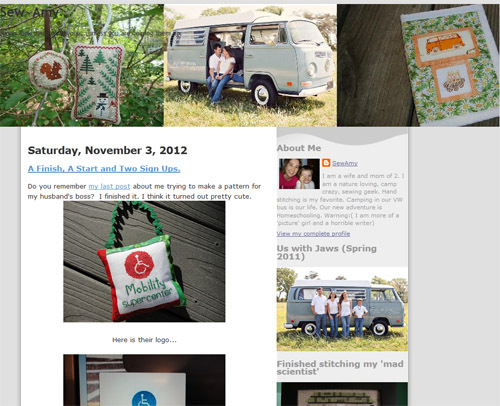 Time for stop number 2 on The Floss Box Fall 2012 embroidery blog tour! Special thanks for all my interviewees, it's been lots of fun meeting each one of you. This weeks visit will be not to a blog as this embroiderer keeps no blog, but to a Flickr stream. 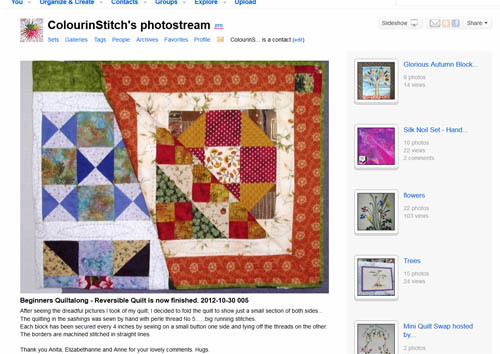 We are visiting the lovely Isabell on Flickr, aka ColourinStitch. I first "met" Isabell a few years ago when I signed up for an ATC exchange hosted by one of the groups. Ever since then I have been a major fan of her work, and I can't really praise her work enough! So please be sure to check out her work, it is truly beautiful, and stunning too! The pictures that follow below are but a small taste. 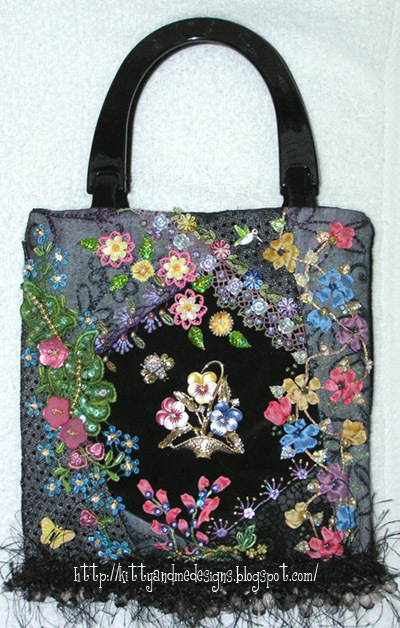 The year was 2004, it was the year I retired from full time work and had more time to devote to embroidery. 2. 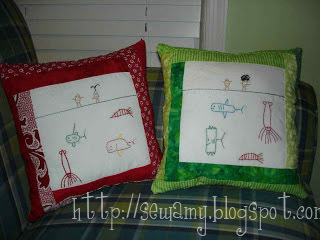 How did you learn to embroider? At first it was mainly through reading magazines and books. I began by Cross stitching samplers. I have always been interested in Tudor history and after seeing an exhibition of Tudor fashion, my eyes were drawn to the exquisite Blackwork designs on the dresses, ruffs and cuffs of that era. I wanted to learn more about it and bought a little book from the gift shop with patterns in it. So began the next stage of embroidery learning. This seems to be the way my embroidery life has continued, learning as I go along. . At the moment it is very much a free style of embroidery. No patterns, just wherever the needle and thread takes me when I begin to stitch. Each day is a new beginning in my embroidery world, inspirations comes from everything around me. Colour, textures, the time of day or night, the kind of mood I am in also plays a part in how I create my embroideries. Some of my most creative work has come when stress has played a part in my life. Without fabric a needle and thread in my hand, I would be lost, embroidery brings me peace and tranquility, it is when I am at my most creative. 4. How do you come up with such beautiful colour combinations? Colour has always played a huge part in my life, I love the seasons with the ever changing colours that they bring. Winter is my favourite season, it reflects the colour palette that I love most. The beautiful combination of stark white mingling with the dark rich colours of green, red, yellow and purple and blue all inspire me. I have recently embroidered eleven pieces of hand dyed felt that I think reflects the way colour inspires me. A colour explosion happens on each piece. 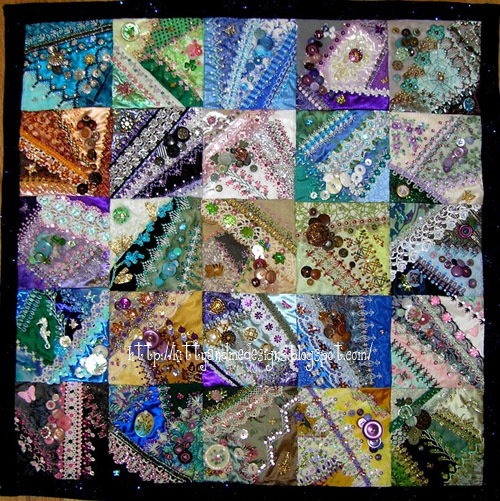 Depth has been added by using different shades and textures of threads. These pieces of work are my own designs, the embroidery I call 'Doodling' because nothing is planned beforehand, just a spontaneous outburst of creative embroidery. 5. Do you have any favourite materials that you like to work with? Silk is my very favourite fabric, so natural and beautiful to work with. My next choice would be linen again a natural fabric. 6. 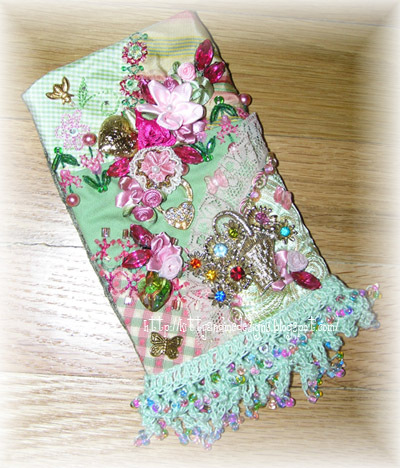 What are your favourite types of embroidery? Crewel Work springs to mind immediately. 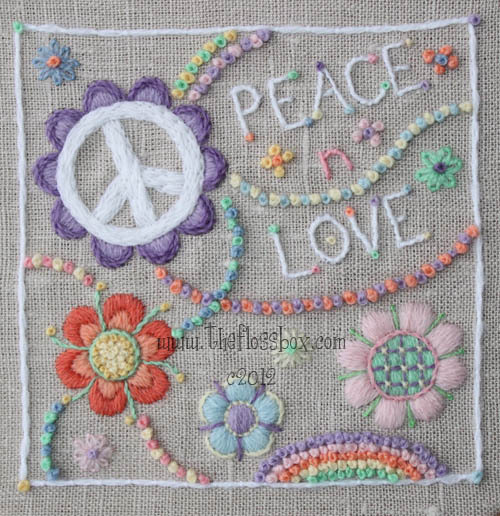 The 'Tree of Life' embroidery is from a pattern by UK designer, Philippa Turnbull. It is the biggest piece of crewel work that I have ever made make and took many months to complete. 7. 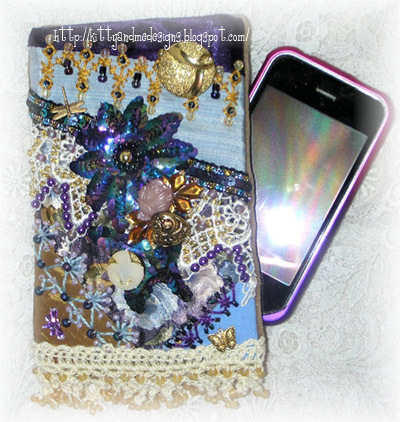 What do you do with your embroidery creations? Apart from the pieces that I give as gifts for family and friends, the rest, of which there are many, are packed away in boxes, each wrapped in acid free paper. 8. What other interests do you have? My interests include being with my family. Listening to classical music and gardening. Visiting Art Galleries, exhibitions and historic houses and gardens all inspire in different ways to be creative wiht my embroidery. I like to watch Cricket and Rugby and going for walk along the beach especially on stormy days, that is when colour really stirs the imagination...dark, dangerous and yet beautiful in its own way. Be sure to go meet Isabell and view her lovely creations!! !